The Great Zimbabwe Ruins are one of the most important archaeological sites in Africa, giving testimony to the lost civilisation of the Shona. A great city existed here from the 11th century on, with over 10.000 inhabitants. Great Zimbabwe ("stone houses") was a main regional trading center, its wealth associated with (Arab) gold trading. There were also trade links with East Africa (Kilwa), and fragments of Persian and Chinese pottery has been found at the site. Arab and European travellers in the 16th century sent marvelling reports home about this place and its impressive stone walls. The site was abandoned in the 15th century (for Khami) because of a lack of food and firewood. The ruins nowadays are spread out over three main areas: the Hill Ruins, the Great Enclosure and the Valley Ruins. Charlotte as a kid back in the 70's, I too used to play hide and seek at the ruins. We then climbed up the massive boulders. Lake Kyle. What great childhood memories. I can't believe that someone in my family discovered a monument so beautiful. Karl Mauch found the ruins in 1871, and I am one of his descendants. I am so proud to have an ancestor that discovers something so eerie and beautiful at the same time. Great Zimbabwe Ruins like the Pyramids is evidence that Africa is the Hallmark of Construction! Born and breed in Zimbabwe I moved to South Africa in the 1990's. For the first decade of my living in SA I journeyed twice a year from Johannesburg to Zimbabwe. What a breath taking trip! The highlight of this journey started with the balancing rocks as you get closer to Masvingo with the final climax my stroll through the Great Zimbabwe Ruins! to this day my family and I try and make that stop regardless of the weather conditions and one unanimous experiences we derive out of this visit is a the AWE and INSPIRATIONAL utopia felt as we realize that GREATNESS of our ancestral Empires, that the people of Africa were GREAT Leaders , Warriors, Technology Drivers and Implementers, GREAT Architecture with the ability to build structures that are still almost impossible to reproduce even today with the equipment we have!! Walking through this structure is a feeling that once cannot fully describe: It has to be experienced. This is a HUGE REASON TO VISIT AND EXPERINCE AFRICA ......LET AFRICA LEAD! I have just returned back from an unbelievable fantastic 16 day Africa tour and one of many treasured memories I have of this trip been a first time visitor to Africa is the half day tour to the Great Zimbabwe Ruins. We had a super guide by the name of Gift who was rich in knowledge and experience of its history and made our day a learning and fun day. Enthralled by the history and becoming son's and daughter's of the Royal family for the day was sooooo cool!!! But not as cool when our group was invited to communicate to the village people down in the valley where we were crouched in this half open air cave and was told to call out altogether or woohoo!!! and the sound will carry or echo for miles..... but our guide never told us that the village people will reply back......that was AWESOME to hear. Reaching the top to enjoy the breathtaking views of the valley below and its village people still living there today and the panoramic views over and beyond were spectacular. I strongly recommend to anyone who is thinking about a trip to Africa "just do it" and visit the Great Zimbabwe Ruins you will not be disappointed. The first time I visited the site with my parents was in 1965. It was something I had heard about from my farther who was in the BSAP and did many patrols in the area prior to the Second World War.I can still remember the excitment on arriving at this mystical almost magical place. I was allowed to wonder and explore to my hearts content for what seemed a few hours. I have since visited the site on my own a number of times the last being in 1977. All my recollections and memories of this very special place is that it has always been in pristine condition and well looked after. The guides in those years were excellent and I can not recall the site being overgrown at any of my visits which included visits during the war. I have only just recently started researching available information and came across your excellent site. The theory that I would prefer to be true is the one that it involved the Queen of Sheba and or Cleopatra but then I am an armchair archeologist and historian and a dreamer.I however do believe the it was built by locals.I would dearly love to visit the site again maybe include it in a Safari sometime. I greatly enjoyed visiting this remarkable historical in 1985 with my parents. At the time I was working as a secondary school teacher in Harare. This superb historical site shows what remarkable things have been achieved by the Shona People when working together in unity. My hope and prayer is that the people of this beautiful country may again be able to achieve great things as they unite together to build their economic infrastructure and achieve a greater level of economic prosperity for all. Visited Great Zimbabwe in November 2011 and found the place fascinating. Obviously a lot of work has gone into restoring the site and now a great deal of it is exposed to view. It's well worth the trip. I would recommend using one of the guides for any tour, as they know a great deal about the place. Our guide, Champion, was a fountain of knowledge and pointed out several things we would have overlooked had he not been there. He was with us for about three hours, took us all over the complex and made the whole experience much better. I consider the site well up to the standard I expected of a World Heritage Area, and those who work there obviously have a pride in their heritage and knowledge. Those who haven't seen it for some years may well be surprised by the work done since their last visit. I thoroughly enjoyed my day at Great Zimbabwe and would say to anyone who is considering going: "Make the time to go there." In 1939 I first visited the ruins with my family when I was six years old. In 1954 I was posted by the National Parks department as Assistant Warden to Mr S.D.Sandes the Curater who was ex B.S.A.P. and C.I.D. (The old visitors book was still there with the families signatures in it. The park though managed by National Monuments Commission in Bulawayo was maned and run by Natioanl Parks Department. There is to much to be written here about what I learnmed from Local Shona people - the assumed five stages of construction and method used - repairs clearly visible in the entrences to the Temple.- hidden weir in old stream - The phalic religion in the Temple design - look at ruin plan from above, can you not see a foetal head-spine along the narrow passage to the conical tower where the foetus is situated.Then to conflict between two tribes - Political involvement and take over. Much much more to tell if of interest. My visit to Great Zimbabwe was amazing.It showed what can happen if we work together.Although what seemed to bother me was why some books i have read about G.Z tell of a different beginning of this wonderful site.I only hope that everyonne in Zimbabwe can spare some time to visit this historic site of Zimbabwe.There is also the issue of entry fees which has risen unepectedly.$5 an adult is no joke.With a family like mine it is very expensive,but pay it is worth it. Regarding the comment inquiring about where the original inhabitants got their water. The Acropolis is built on a hill below which is a vlei [marshy low lying ground] In days gone by this was a lake and actually formed a part moat giving added security to the only entrance into the Acropolis. Twice I have visited Great Zimbabwe and the last time I did I must say the awe that first struck me the first time had been amplified twice. The place is simply amazing. Those guys of old were definitely more sophisticated than us guys to be able to build that structure without computers, winches, dump trucks and all. They deserve our respect. In 1985, my husband and I---with my sister, sistr-in-law, and two friends---were traveling the length of Africa and visited Great Zimbabwe on the recommendation of a niece who teaches African history. We hired a guide but he was unable to keep the appointment and sent his teen-age son instead. That young men was obviously ignorant of many facts and told us a lot of nonsense he must have fabricated (such as separate balconies for boys and girls in the hill ruins). There was no museum or other official structure at the site so we had to learn the real facts about Great Zimbabwe from other sources after we returned to the U.S. What a pity that the young people of Zimbabwe were not taught about their country's history! I visited as part of a 14 day safari in July 1993, camping overnight at the site. I was stunned. In response to some negative previous comments, I can only say that the artifacts disappeared long, long before the present regime came to power. Perhaps they went into the great museums of the western world. July of 1970, traveling solo on a Honda 360 motorcyle, I had the fortune to spend two days at the site. The entire time I felt that many of the spirits were still actively living on site. Thirty nine years latter I vididly in my mind return frequently to the site. I had all my 35 mm slides put on to dvd of the four months African trek. The tourist village was still on site. Thank you for providing a blast from the past 3/13/09 with this web site. We went to the ruins in 1974 and we camped next to them. We climbed everywhere and I don't remember seeing a tour guide. I traveled with three architectual students. We were all awed. We loved the place. It was so quiet and the spaces so still. I didn't find it alien but a warm place where a people danced and sang and lived. The stones are so beautifully made and the sun and shadow so contrived to constrain and free the person. We knew the official view of the origin on the ruins but didn't believe a word of it. I am a descendant of the royal house of Great Zimbabwe. The Hungwe Dynasty.The ruler was a Great Woman Queen, and her known name is "Queen Of Sheba".The Great Zimbabwe was a trading post, ant the ruler queen,was a great traveller,as she had Gold to back her travels,which became known as "King Solomon's Mines".This can be proved by the fact that the surrounding area all the way to Johannesburg South Africa is still Rich and has an abundant supply of Gold,not to mention diamonds.The Great Zimbabwean ruins according to biblical scriptures and prophecy are to be there until the Messiah (Jesus Christ) comes back to reign in the millenium (1000 years)golden age,as it says that Kingdoms will come to give tribute to the lion of Judah in Jerusalem,inclusive of Queen of Sheba kingdom.There are also some detailed secret things l am aware of but am not supposed to reveal for cultural reasons and the traditional law. i nevery knew architecture existed since time immemorial. I have been to Great Zimbabwe and was fascinated by the design and size of bricks used long back then. can go back there ten times more. The Ruins, just in/around Masvingo were actually more than I expected. In times of economic downfalls, rampant inflations and food shortages...this was a little piece of heaven and history. Actually I went 2 times over the weekend I spent there. I found the tour guide, from our hotel, to be clear, concise and well informed. The links of history made it clear that this was once a place envied by other African Leaders as it was the largest trading hub in its day. The structures are not maintained like overseas but the impact of the size and height is still there. Highly recommend it for people in Zim and those visiting.... although it should be noted that you have to drive there. I visited the Zimbabwe ruins on safari last year and was told they were created hundreds of thousands of years ago by "gods!" Documentation is found in the oldest writings--Sumerian tablets. An advanced race "fell down" to earth (as even the Bible states) and humankind was created genetically as slave labor by these so called "Annanaki" to mine gold from African sites. There's a fine line of translation between "fallen angels" and what we now call UFO visitors. Seems we're not the first to know about DNA, cloning, space shuttles, etc. There are mines in Africa that are over 50,000 years old. The tour guide claimed the gold was needed by the Annanaki and slave labor was the answer. After all, it's a strenuous ordeal to mine gold from ore; early humankind didn't do it just to wear shiny baubles--they were forced to! I came away from the tour scratching my head, but I admit I was fascinated by the different interpretation. We visited the ruins in May 2007. We found the staff friendly, helpful and respectful. They were all trying so hard to do their best in these hard times. The ruins were spectacular to see, such a huge site and the guide seemed up to date and knowledgeable. Unfortunately he destroyed any inclination that the ruins were built from aliens from out of space but much more reasonably believed over time the people integrated into other tribes and probably even he was a ancestor of the people who once lived here. We were only alowed to pay the entry fee in foreign currency. My parents were American missionaries in Cheredzi from 1969-1974 and then in Salisbury and Marandellas from 1975-1979. We often took our holidays camping near Fort Vic at Kyle Dam. Father always took a morning to take the family to the ruins. Even as a child my memories are vivid of the awesomness and mystery of this place. It takes one back to our origins and echos of a distant time and place where ones imagination can still smell the wood fires and hear the bustle of an ancient chiefs court and place of commerce. Many secrets lie here. I miss you Rhodesia....Zimbabwe my heart lies in thee still! Years ago I travelled to Zimbabwe from NYC for a cycling trip through this breathtaking country. This was one of the stops that we made and I remember the mixed feelings I had when encountering the ruins. As a black woman, a professional Architect, I was angry and dismayed that I never learned about this in all my schooling! I never knew the Zimbabwe Ruins even existed and it seemed so important that children of color should know about it. I was also awed by the culture that built these and this was a wonderful discovery. i learnt about the ruins at university and was fascinated by the work i read. however, the amazement and fascination was nothing compared to the real thing. the huge structures, the massive walls, the marvelous hill complex and the inexplicable great enclosure made me believe that you've never really experinced 'it' until you've really been there. I just came back from a trip to Zimbabwe (Aug 2004). Great Zimbabwe was one of the stops on our ten-day safari. It was nice to forget about all the bad press and experience this great piece of Zimbabwean history. I felt frustration, but was really not surprised, when our wonderful Zimbabwean tour guide told us how, for centuries, white man repeatedly tried to rewrite history, arrogantly refusing to believe Africans could be capable of creating this remarkable village. Our guide always explained these historical events with such class; with perhaps a slight hint of regret in his speech but never making derogatory comments about whites or anyone else. He had obvious pride for his ancerstors and was honored to tell us all about it, which is how we found most of the people we've met all over Zimbabwe. While alot of the structures in the ruins have been turned upside down and stripped by treasure hunters, what remains is definitely worth seeing. You don't often get the chance to sit where kings previously sat and you can't help but feel perhaps they are looking down on you today. Do it either pretty early in the day or towards the evening to avoid the midday heat, and bring water. As a child, I went to Boarding School in Gwelo, and often passed the ruins on my travels to or from school. I always felt that this place was where we all came from. It has a real draw to it and feels important to the soul. A must for anyone visiting Zimbabwe. Female Archaeologists : Gertrude Caton-Thompson (1888- 1985). In 1928 led an expedition sponsored by the British Academy which "led her to the unequivocal view that Zimbabwe was the product of a "native civilisation" (Wiki). Country named after them: Wiki provides 2 different possibilities for the origin of the word "Zimbabwe". One suggests that it "is probably a short form for "ziimba remabwe" or "ziimba rebwe", a Shona term, which means "the great or big house built of stone boulders". Alternatively it might be a contracted form of "dzimba woye" which means "venerated houses" in the Zezuru dialect of the Shona language. The word appears to have been used generically by Europeans of the many stone ruins they came across in the Shona heartland hence the name "Great Zimbabwe" was applied to the largest/most famous. 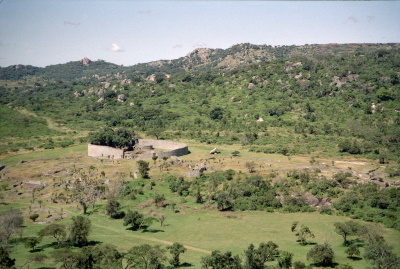 In his book "The ruined cities of Mashonaland" describing his investigations of the site in 1891 the archaelogist Theodore Bent was already describing it as "Zimbabwe". (The first European to visit it had been Rauch in 1871). The site became an important symbol of achievement for black Africans and was adopted as the intended name for Southern Rhodesia after independence and was being used from at least as early as 1961 in the name of the independence movement ZAPU.